If it is true that a picture is worth a thousand words, a visual memory of a good clinical case will be retained and absorbed in a way that traditional text readings are not. 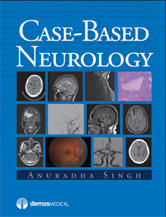 Case-Based Neurology offers an overview of a wide range of common neurological conditions. Organized by chief complaint and presented in a consistent format, each case includes history, "stop and think" questions, physical examination, laboratory testing, imaging findings, diagnosis, and discussion, including differential diagnosis and treatment. References and suggested readings follow for further study.